Do you ever wake up, just as the morning is breaking, everyone still sleeping, with the urge to creep outside, alone, before the world catches up with you? This is how I found myself this morning, wrapped in a blanket, cup of tea in hand, sitting on the bench under my Magnolia Tree. It was so quiet, just me and the birds……..a light frost on the tender edges of the new leaves that are gently unfurling as far as the eye can see. The ground was wet, and smelled deeply of earth, somewhere to the east, the sun is rising behind a grey curtain. Just above the horizon, I caught a glimpse of this month’s waxing moon, rising in the monotone sky, the April Egg Moon, or the Pink Moon, or the Hare Moon, whatever name you wish to give it. And there they were, just across from each other in the sky, the sun and the moon and yet so very, very far apart. And it felt, just for a moment like the world had stopped, and I’d stepped outside of time, just to glance at how very beautiful it all is. Just me and the birds. I realised, I have been holding my breath through the stop/start month of April. One minute the glorious dawn of spring is upon us, and the next it is rolled back into an autumnal dankness. But it was ok this morning, sitting for a while, hidden in the gloaming from the world of people, wrapped in the grey, and the damp and the quiet, because I could see the bright, new green of the world emerging, and I could see the waxing moon in the sky, and I knew in my very bones, that all this grey is just a breathing in, before a great stretching out. 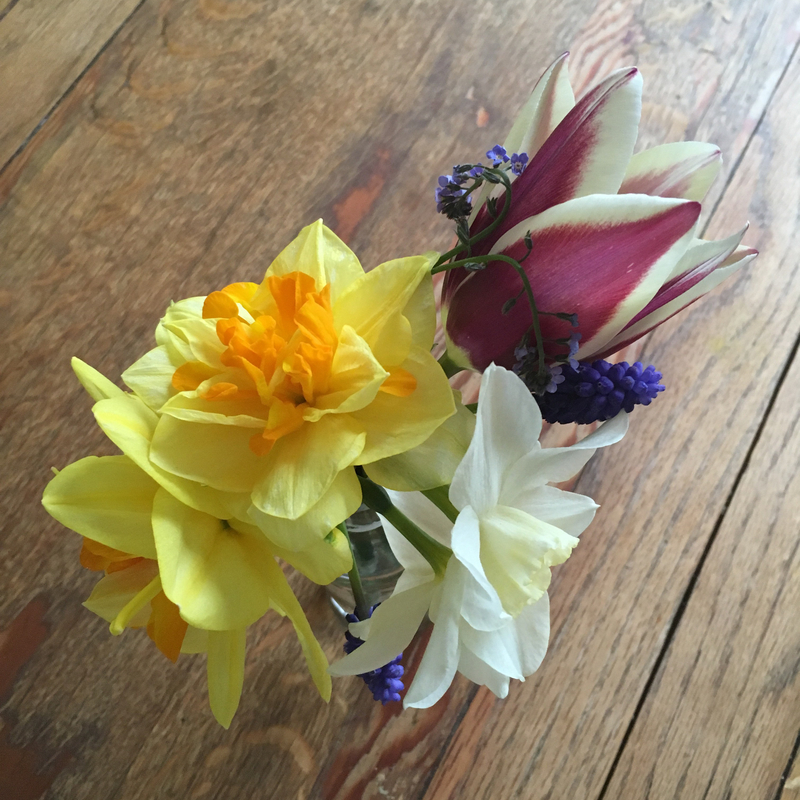 So, after a while, I stepped back down into the grass, breaking the spell of the moment, and I picked this little bunch of flowers. I picked them as a thank you to the waxing moon and the valiant sun of April, for their growing promise in the sky, and I picked them as a reminder to myself to step outside of the world of people, to take the time to feel the wet ground on my cold feet, as this is where the magic of the world lives for me. From the windows of the house I could here little voices saying ‘Mommy’ and I knew it was time for me to join the world once more……taking my flowers with me. Wishing you a moment out of time this April.